Although monochrome prints in sepia and various other shades of brown are familiar to most serious practitioners of the art of photography, and the chemistry is fairly well established, the same cannot be said for green tones. In fact, a literature survey of the history and chemistry of green prints reveals somewhat of a mystery. Leaving aside production of green images by a combination of yellow and blue toning, or by vanadium ferrocyanide, or dye toning, the color in question can result from light scattering and reflection from silver particles alone, either from a special emulsion given normal development ( e.g., metol and hydroquinone), or from a more traditional emulsion and special processing, in both of which solution physical development appears to play a significant role. Let us examine each pathway in turn. Special Emulsions With Conventional Development. Kodak "Velvet Green", formerly Artura "Carbon Green", available since at least 1908 (Rowe), was mentioned in the original edition (ca 1911) of "How to Take Good Pictures", with an actual print included in the book. Subsequently, this contact paper was advertised in various photographic literature until the late 1930's (Hammond). It has also been described as a very slow special emulsion which develops out green in an ordinary developer" (Mack and Martin). In a Kodak booklet on Artura photographic papers, the speed of Velvet Green was given as approximately 1/10 that of contemporary chloride papers. The author was fortunate to obtain two unopened packages of Velvet Green, postcard size, dated October 1, 1911, from a dealer in photographic ephemera. The original developer recommended, Kodak "Nepera", was apparently a metol-hydroquinone type. In this connection, it was advised that no iodide be added to "Nepera" developer when used with Velvet Green paper. Because of the great age of this paper, D-72, a modern M-Q developer, gave not unexpectedly unacceptable fog. With Kodalith Fineline developer with benzotriazole, which is an excellent developer for "ancient" photographic paper because of the extremely low sulfite concentration, brown tones were produced with Velvet Green. Good contrast and only slight fog resulted from a low sulfite concentration amidol developer with benzotriazole anti-foggant. The image had a rather dark i.e., "Hunter Green" tone. The paper gave a positive brown qualitative spot test for iodide, i.e., thiocyanate followed by acidified hydrogen peroxide. Unfortunately, absent quantitative analysis, the proportion of silver iodide cannot be stated. Mimosa "Verda", an enlarging paper from the 1970's was clearly denoted as having a silver iodide emulsion (Popular Photography). This paper, which the author used at the time, gave brighter green tones (M-Q developer), which were less striking than those of Velvet Green, and was fairly rapid. At this point, one may conjecture on the mechanism involved in green color production. For the aforementioned photographic papers it is reasonable to assume that both direct development and solution physical development are involved in image formation. While the former generally leads to filamentary silver, uniform light absorption across the visible spectrum, and a consequent black silver deposit, the latter favors formation of colored silver images via spherical or tabular particles, which absorb and scatter light selectively with wavelength (Solmon). Thus, spherical particles can shift from yellow to magenta to blue as size is increased. Relatively small grain size paper emulsions, especially those containing silver chloride or silver chlorobromide, are amenable to solution physical development because of relatively large available surface area and greater distance between individual grains. At least three instances of green silver appearance correlated with particle size have been reported in the literature. Wiegel examined silver hydrosols (James and Vanselow) by scattered light and observed a green color with spherical particles of diameter 0.035 - 0.045 micrometers. Solman noted spherical particles in gelatin by reflected light that were green when diameter was 0.14 micrometers. Berry and Skillman found that ellipsoid silver particles in a fine grain emulsion of a size 0.04 x 0.02 micrometers, as considered with absorbed light spectra, were green. While photographic emulsion formulations are among the most closely guarded secrets of manufacturers, some clues can be found in the open literature. In general, silver chloride papers have low printing speeds while silver bromide papers are quite rapid. Emulsions of intermediate speed are found with chlorobromide papers. While some silver iodide (ca 5%) is often found in film emulsions, a pure silver iodide emulsion is very slow and may require a powerful developer, e.g., pyrogallol at 50-65 degrees C (James and Vanselow). However, it was noted that speed could be increased by bathing the paper or film in solutions of acidic silver nitrate, sodium bisulfite, etc., or by incorporating 5 -20% silver bromide in the emulsion, which increased concentration of interstitial silver. In this connection, just as chloride in silver chloride or in chlorobromide paper emulsions can be significantly replaced by bathing in strong, aqueous potassium bromide (Current), so too can chloride or bromide be replaced by aqueous potassium iodide in a similar manner. Perhaps this approach to green tones on paper merits further experimental studies. As a point of reference, Odell's physical developer made use of a film presoak (1.5 minutes) in a solution of potassium iodide (1% ) and sodium sulfite (2.5%) to speed up development. However, excess soaking time, e.g., 4 minutes, convered such a large proportion of the initial silver halide to iodide that no development occued (Lowe). Thus, if one is to approach production of silver iodide paper in this way, the aforementioned should be kept in mind. Pour Solution 2 at room temperature into Solution 1, heated to 50 degrees C, stirring constantly and cool. In addition to small silver halide grain size in a photographic emulsion, solution physical development is favored by the presence of a silver halide complexing agent in the emulsion and/or the developer. Iodide ion released by reduction of silver iodide by developing agent would be expected to complex undeveloped silver iodide to give complex species such as silver diodide anion. By way of comparison, Nietz has calculated that for an average negative emulsion, development to a density of 1.0 results in an initial emulsion concentration of liberated bromide ion of 0.05M. Silver iodide complexes are known to form at the 50% level at an iodide concentration as low as 0 .00002M (Rott and Weyde). One may speculate that emulsions such as prepared by Steigmann yield green tones because of the initially favorable size and shape of the silver iodide grains, and/or because solution physical development is favored by formation of silver iodide complexes. Conventional Emulsions with Special Development. Green tones have been reported with Artura "Iris" chloride contact paper, popular during the period 1910-30's. An actual brown tone print on this remarkably attractive paper is found in issues of American Annual of Photography for 1912 and for 1916. Here also, significant solution physical development is assumed. Nietz and Huse found that a chlorohydroquinone developer with excess of potassium bromide (6 g/l) gave olive tones with the paper in question at around one minute development, timing being crucial. With the same paper, Lowe obtained green tones with Edwal #106 developer (glycin and hydroquinone) with 3x normal exposure, dilution 1:7 and 60-90 seconds development. Similar results obtained with Kodak (Vitava) "Opal", a slow chlorobromide, obsolete enlarging paper at a 1:15 dilution of Edwal #106. Green tones have also been recorded for warm tone lantern plates with a hydroquinone developer containing potassium ferrocyanide (Glafkides). As digital photography becomes the choice for the many, the chosen few may have to dig deeper into the more esoteric aspects of silver halide photography in order to obtain satisfaction. Two excellent sources for this are the Encyclopedia Of Photograpy and the Dictionary of Photography. Current, I.B., "Some Factors Affecting Sepia Tone", PSA Journal Annual, pp 684-687 (1950). Dictionary of Photography, A.L.M. Sowerby ed.,19th Edition, Iliffe, London 1961. Encyclopedia of Photography, B.E. Jones ed., Arno, New York 1974. Glafkides, P., Photographic Chemistry, Vol. 1, p 81, Fountain Press, London 1958. Hammond, H., "How to Tone Prints", p 68, American Photographic, Boston 1940. Developed Silver", Photographic Science and Engineering, 1, 104-118 (1958). Science and Engineering, 5, 21-29 (1961). Kodak, Artura Results, 9th edition, Rochester, n.d.
Kodak, How to Take Good Pictures, Library Edition, pp 35, 106, 117, Rochester ca 1911. Mack, T.E. and Martin, M.J., The Photographic Process, p 322, McGraw-Hill, New York 1939. Nietz, A.H., Theory of Development, p 146, Kodak, Rochester 1922. Research Laboratory, 13, 16-20 (1917-1918). Engineering Chemistry, 25, 877-879 (1933). Popular Photography Directory p 187, 1958. Rott, A. and Weyde, E., Photographic Silver Halide Diffusion Processes, pp 180-181, Focal, London 1972. Journal of Chemical Physics, 48, 3297-3304 (1968). Journal of Photographic Science, 18, 179-184 (1970). 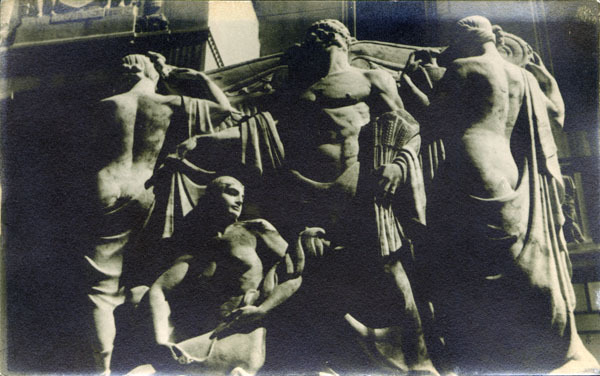 abstracted as "Green Tones by Direct Development" in British Journal of Photography, 84, 167 (1937). This article is copyright 2007 by Harvey W. Yurow, Ph.D. All rights reserved. This article may not be reproduced in any form without the express permission of the author.